This is the second article in a three-part series about the winners of USA Cycling’s 2016 spring new member recruitment contest. Is your club doing things like Prince William Racing? Then apply for the 2016 Club of the Year award. The sweet joy of crushing October leaves under their tires reminded three mountain bikers of something they longed to do but were putting off. And it was the same thing for each of them. They wanted to establish a local youth mountain biking team. One of them had even taken a first step. But going the distance alone felt too daunting given the many claims on his time. Luckily for kids from the Prince William County, Virginia area, this trio of Becky Barkett, Brian Balas and Trey McKinnon decided pooling their resources and time would enable them to quickly get a team off the ground. In January, 2016 they launched Prince William Racing. About twenty-three girls and boys—nearly evenly split between genders—have raced with the club in its inaugural season. Focus on the single cycling discipline of mountain biking has produced a unique blend of benefits for youngsters that, along with the adults’ approach to starting and managing the team, has accelerated early success. The three team founders brought different backgrounds to their endeavor. 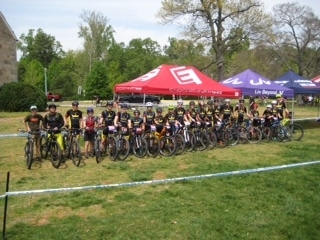 Barkett is a mom and she volunteers with the Quantico Mountain Bike Club. McKinnon coaches and directs an established youth triathlon team at Endorphin Fitness club, so he had ready access to recruits interested in fat tire competition. McKinnon also had years of experience managing a junior sports team. They gathered an interscholastic team of middle and high school students, drawing on McKinnon’s flock, word of mouth and advertising in local bike shops. While the club is not school-based, the juniors’ schools support the program by allowing gymnasium use and granting excused absences on race days as needed. Home-schooled kids can join the team too. The student athletes can compete in either or both fall and spring season racing series. The Virginia league of the National Interscholastic Cycling Association puts on fall races; the USA Cycling sanctioned Virginia High School Mountain Bike Series rolls in the spring. The cyclists train together and learn about trail etiquette and conservation as well. The co-founders concentrated on keeping costs low to make joining affordable. All athletes get a jersey; purchasing matching shorts is optional. Balas pitches in his mechanical skills to try to minimize equipment repair expenses. Balancing the first year’s work with their schedules, McKinnon led the spring racing drive and Balas and Barkett managed the fall season. Balas handles the website and acts as Treasurer. Barkett focuses on coaching and teaching skills; she says moms of girls on the team are grateful for a woman on the coaching staff. All three of the founders are USA Cycling certified coaches. They also sought and received assistance from the surrounding cycling community. The trio tapped other teams for information and connected with the Trails for Youth nonprofit to supply loaner bikes to team members who needed them. They partnered with a bike shop for club discounts. Balas continually seeks out people willing to donate their time and talent. That’s how he enabled one team member to not only replace a set of worn out wheels but also develop useful expertise. Balas connected with a master bike mechanic and wheel builder, Bill Mould, who resourcefully procured parts for a new wheelset and personally instructed the girl as she assembled the wheels. By building the wheels herself she gained a lesson in self-reliance. Cycling in general teaches that skill, but self-reliance is an especially important building block for mountain bikers. Out on remote trails, riders can find themselves temporarily stranded by a mechanical issue or other problem they have to fix with their wits and whatever they’re carrying. That’s not scary, but instead part of the adventure and just one example of the appeal of mountain biking and how it helps kids get ahead. As Barkett points out, mountain biking requires “individual effort 100 percent of the time.” No one warms the bench. Everyone rides. Everyone races. Participating as a club member also offers the experience of being part of a team. As such, the fat tire sport presents a great option for kids who don’t take to mainstream sports. That’s why Barkett had really longed to set up a club. In addition to introducing youngsters to a lifetime sport, she wanted these kids to have access to lessons learned from mountain biking that carry over to dealing with life’s challenges. Prince William Racing’s training and coaching process suits energized kids and those who “just can’t wait for their turn to play.” The coaches run active practices, mentoring as opportunities arise on trail rides. “There isn't a lot of sitting around while being coached,” she adds. They move practice rides around to introduce different trails and terrain, exploring the wide variety of riding in the area. To facilitate another lesson, the coaches layer goal-setting onto an emphasis on fun and safety. Every ride and race becomes an opportunity to attain a new goal and the kids benefit from turning disappointments into accomplishments. Cutting falls in half on the next outing is an achievement. Another rider might aim to pedal over a gnarly root instead of dismounting. With goals to chase and coaches to guide them, Prince William Racing juniors realize they’re capable of more than they imagined; they find themselves as young adults.